Emirates, a connector of people, places and economies, debuted the new Real Madrid decal on its iconic A380. 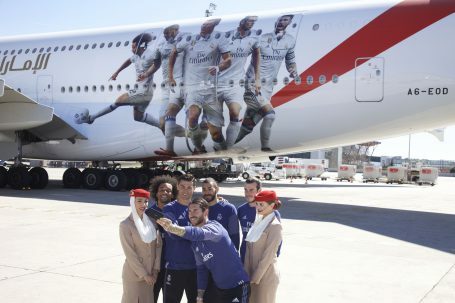 Making its first touchdown at Adolfo Suárez Madrid-Barajas airport, the Emirates A380 has been emblazoned with the image of Real Madrid footballing giants: Cristiano Ronaldo, Gareth Bale, Sergio Ramos, Karim Benzema and Marcelo. Visible from both sides of the plane, the bespoke decal covers an area of ​​more than 500m2 and shows the five players of the first team in action. Besides Madrid, the Real Madrid A380 is expected to fly to a majority of Emirates A380 destinations worldwide, giving Real Madrid fans around the world a chance to snap a picture of the aircraft as it makes its way around the globe. This includes the US where the team will be travelling this summer. Emirates is the Official Main Sponsor of Real Madrid, which has one of the largest fan base globally, since 2013 with Fly Emirates branding prominently displayed on the players’ kits. Emirates is the world’s largest operator of the double-deck A380 aircraft, with 93 in service, and 49 other pending delivery. It serves 46 cities in 5 continents with this popular aircraft. Spanish travelers have the opportunity to experience the A380 on three of the four flights operated daily from Barcelona and Madrid. Testament to the popularity of this flagship aircraft amongst customers, it has transported nearly 70 million passengers since 2008.